On 1st November, we held the launch of the PSA Commission on Care Report Towards a New Deal for Care and Carers – at the House of Lords. The report was based on a year-long inquiry into the state of care for older people in England undertaken by academics and policy experts from the Universities of Warwick and Liverpool, the Women’s Budget Group and the Fawcett Society. 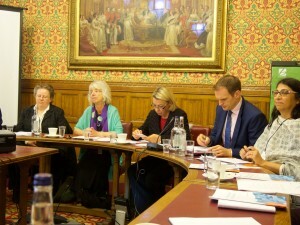 The launch event was hosted and chaired by Baroness Ruth Lister and the Commission’s findings were discussed by the MPs Barbara Keely (Labour), Dr. Dan Poulter (Conservative), Caroline Abrahams (Director, Age UK), Sam Smethers (CEO, the Fawcett Society and Commission Co-Chair) and Shirin Rai (Warwick University and Commissioner). The report draws particular attention to how women bear the brunt of the crisis currently impacting the adult social care sector in England – as women are far more likely to step in as unpaid carers when state provision is cut and women are more likely to be recipients of care. The report, Towards a New Deal for Care and Carers, laments the failure of successive governments and political parties to recognise social care as a political priority. Growing demand resulting from a rapidly ageing population and cutbacks to funding has left the formal care system at breaking point with high levels of unmet needs, low pay and poor conditions for care workers, and an increasing reliance on unpaid carers. There are now a million older people with care needs that are not being met by any public source. 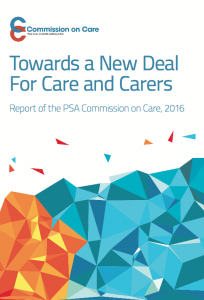 Among the Report’s Recommendations are; calls for the establishment of a National Care Service which, like the NHS, should be free at the point of access, increased investment in social care, professionalization and support of the care workforce, and recognition of the work of unpaid carers. The Report and its executive summary including recommendations can be downloaded here. The findings of the Commission were enthusiastically endorsed by the speakers at the launch as well as by many of the audience members. The launch of the Report does not mark the end of the Commission’s activities however, all those involved in the Commission are committed to taking up the issues raised and ensuring that care for older people becomes a more significant issue politically.